You'd have to go a pretty long way to put a dent in one of these poles or stakes, but if you manged to accomplish it you need to look into a Pole and Stake Set for 20 x 20 Mystique High Peak Tension Canopy Tents . This set of tent poles and stakes is designed to perfectly complement the Mystique High Peak Tension Canopy Tent top of the same size. 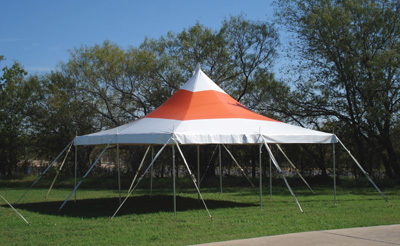 The sturdy tent poles are made of the same high-quality level of materials that the rest of the structure and canopy top are. All of the poles are made of heavy-gauge steel that is very strong but lighter than you'd think. The triple-reinforced stress points give you even more stability and strength. Add in the carrying bag and the heavy-duty stake set for added security, and you're looking at a pretty worry-free afternoon outdoors. A tent is only as good as its support system. Don't let your outdoor experience get ruined by using substandard equipment. Use the best. The Pole and Stake Set for 20 x 20 Mystique High Peak Tension Canopy Tents is the best, easiest way to ensure that you, your family, and your guests have the perfect time without having to worry about your tent.